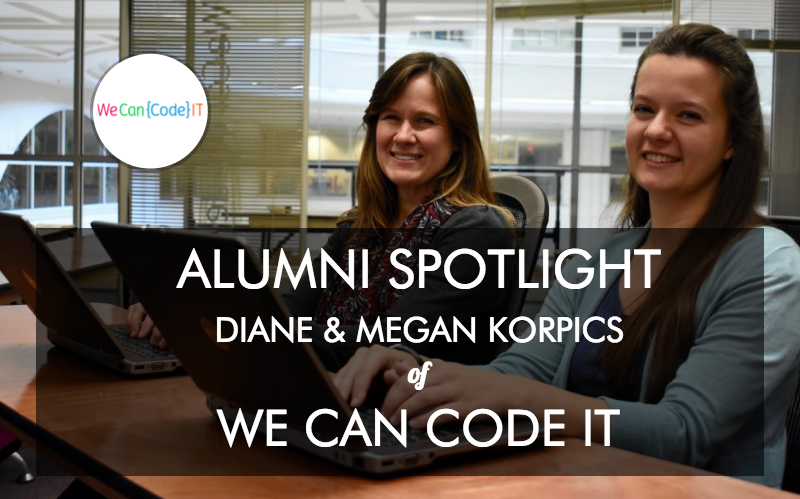 Like many bootcampers, Megan Korpics was first encouraged to try programming by her mom, Diane Korpics. And when Megan fell in love with coding and applied to We Can Code IT in Cleveland, her mom decided to learn alongside her! Diane was a former chemical engineer before taking 10 years to homeschool her children, so she had some experience with older programming languages but wanted to update her technical skills. We asked this mother and daughter duo what it was like learning to code together at We Can Code IT, what they worked on for their final projects, and their plans for the future! What were your education and career backgrounds before you decided to go to We Can Code IT? Diane: I have a Bachelors in Chemical Engineering from Texas A&M University, and worked as an engineer for an oil company in Texas. As an engineer, I used coding languages like Fortran, which was probably my favorite part of my job. After eight years, I decided to stay home and raise my three daughters. When Megan was in third grade, I started homeschooling her while running payroll and taxes for my father's business. Since then, I’ve been teaching math and science at a small private school for homeschoolers for the past 10 years. Megan: After being homeschooled with my mom, I went to Hillsdale College, a small liberal arts college where I double-majored in English and German. I was always fascinated with literature and languages and everything about them. When I graduated, I decided I didn't want to work inside all day, so I went out West to train horses, while simultaneously substitute teaching in the school district. How did you each come to the decision to want to learn to code and go to a coding bootcamp? Megan: Mom had been after me to start coding for years. Diane: I just knew Megan had a really good aptitude for coding. When she was young, she was always getting 99% in her standardized math tests without studying. Even when her interest shifted to reading and literature, her math scores never dropped. But she never had any interest in math. I explained that coding is really unique because it uses more logic than math. It's also very much like learning a new language, which is Megan’s specialty. She's learned Latin, Spanish, and German and loves all of that. I convinced her to at least take a class and see how she felt about it; there is something so unique about coding and I knew she was built for it. Megan, did your mom eventually convince you? Megan: Even though mom had been encouraging me since high school, I thought that there was no way coding would be the right fit for me. That was my mindset for many years until I ran into a good friend (who also had a literature background) at the airport and she told me she had just graduated from We Can Code IT. She thought it was perfect for me, so I decided I actually needed to try it out. I was really missing the academic world and I tried out some free resources online, and immediately thought, "This is everything I was ever looking for!" I started looking into coding bootcamps. I decided to go to one here in Cleveland so I could live at home. We Can Code IT made sense because my friend had really loved it and got a job afterwards. Diane, how did you decide to go to We Can Code IT with your daughter? Diane: It wasn't a hard decision. My coding experience was ancient and I knew I eventually needed to decide on a different future. I wasn’t earning a lot of money working for a private school. I had a lot of options, but programming was the part of engineering that I loved. I didn't feel confident at this stage of life to get back into engineering without updating my skills. Since Megan was going to do it, I thought why don't I do it? I'm so glad I did this. I just love it. I could go from morning until night and not even look up from the computer and just be happy. What did your class at We Can Code It look like? How diverse was your class? Diane: It was very diverse. Almost half of our class was African-American and half Caucasian; and probably about half women and half men. I think We Can Code IT usually has women like me who are reentering careers after raising children, but in this particular class, I was the only older person and everyone else was around 25 to 35. Megan: And there were a lot of different backgrounds. There were people with military backgrounds, someone in neuroscience, and a mechanical engineer. Most people in the class really didn't have any coding exposure at all, and many did not have college educations. Diane, with your teaching background, what did you think of the teaching style at We Can Code IT? Diane: I thought it was awesome. Our two instructors were just amazing and very skilled. Being a teacher, I know how difficult it is to teach a diverse group in terms of experience, ability, and aptitude – We Can Code IT did that very, very well. They tailored the course so they wouldn't lose anybody who couldn’t keep up. With coding, you have to learn a lot on your own, doing a lot of Googling, so the instructor could stretch the advanced students, but move slow enough so that everybody could keep up. I'm very impressed. How much does We Can Code IT encourage collaboration? Did you do a lot of group projects, and were you working together on those projects? Diane: For the first two months, we did independent weekend projects. But the instructors don’t mind if you collaborate with other classmates, as long as you're writing the code and learning it. In a real job, you’ve got to figure out where to get help. We just turned in our last project, which is a group project that takes the last three weeks. We split into groups of four, and Megan and I were in different groups. Megan: We did the independent projects so that we were all individually getting the same exposure to coding, and all equally learning because we had to write all the code ourselves. But they definitely encouraged collaboration, and doing pair programming each day, from day one. We were always encouraged to ask each other for help and help each other out before asking an instructor. They want us all to be writing our own code. What were your favorite projects that you worked on at We Can Code IT? Diane: My favorite project was the final project, because I got to do a little bit of everything: the back end, databases, and also the front end. Our project, Ready Recruit, was a realistic idea that could be deployed in the real world. Users who are thinking about joining the military can use Ready Recruit, to aggregate information from the Army, Marines, and Navy websites. They can see a schedule and a checklist to decide if the military is right for them. It was a cool project and fun to work on. Megan: My favorite project was also the final project because I got to put everything together that I had been learning, and was thrown into the deep end to some degree. You’ve been learning the foundations at We Can Code IT, but the project lets you use new technologies that you didn't actually learn in class. It was incredibly challenging but so wonderfully rewarding to confront technologies that you knew nothing about, and then to actually see it start to work and come together. And honestly, I had the best team ever. It was so much fun. Our project is a site that helps people with dietary restrictions find restaurants. Two of my teammates are vegetarians, and I’m wheat-free, so we can all relate to the adventure of finding lunchtime options. Users can write reviews and look at restaurants to see which ones fit their requirements. What has We Can Code IT been doing to help prepare you for the job search? Megan: They've been absolutely wonderful. In Week One, Cynthia started introducing us to Career Services. She's just been absolutely amazing. She taught us about the interview process, how to write five-star stories, how to prepare for interview questions, and helped us write our resumes. We’re also able to schedule meetings and appointments with Cynthia and she is always more than happy to meet with students. She walked us through everything from connecting with people on LinkedIn, to emailing employers, to how to network. From start to finish she's been there guiding us through step by step. Diane: And for those of us who are lazy when it comes to networking and putting ourselves out there, We Can Code IT brings employers in at lunchtime to talk about their companies, and it’s helpful to make those connections. We also have a career day where we not only present our projects to our classmates, but also to real employers who get to see our projects. That’s a great feature that We Can Code It organizes. Do you both plan to apply for developer jobs now that you've just graduated? Megan: I’m happy to do any job that involves programming. I tend to prefer the back end so I want to look for a job where I can continue learning back end. But I definitely want to work in software development, writing code. I’m interviewing with a great company here in Ohio right now, and would accept a job offer from them hands down. If not, then I'll head to Seattle and see what opportunities are there. As long as it's coding I'll be happy working anywhere. Diane: I'm in a strange situation in that I am one of the few in my class who isn’t looking for a full-time job. As such, I want to find a little more flexibIlity in my career. However, I'm torn between trying to find a flexible, part-time, remote role, or going into a company and getting the training I really need to be a better programmer. That's my current dilemma, but there's no doubt that I just need to keep coding after graduation. I will continue to code whether I'm coding for a career, because coding really is my passion. How do you both feel about entering the tech world as women? Is We Can Code IT approaching that topic with your class? Megan: We talk about diversity in tech. Mel, the founder of We Can Code IT, who is amazing, gave an awesome presentation as part of Women Who Code about being a woman in the coding field. They’re encouraging more women to start participating in programming. Personally, I'm really excited to enter the tech field. I can't really say that the presence or lack of women in tech has been much of a consideration for me. Who knows, maybe I’ll feel differently once I get in the job. But right now it's just a non-issue. Diane: Being an engineer in a different generation, I was one of the few women in my field. And at my company, I was the only woman in my whole engineering department. I never even stopped to think about it. At Course Report we get a lot of questions from late career changers, like moms trying to reenter the workforce. Diane, do you have advice for them? Diane: It’s been a great experience so I absolutely recommend it. I think that part of the challenge is generational. Technology has come a long way between the young people of today and when I was their age. These kids grew up playing video games and using computers. So for me, it's hard because we didn't have computers until much later in my life. I can get in the back end and code very comfortably, but my challenge comes when we have to transfer files around and deploy to GitHub, then digital studio, then SQL Management Studio, then Slack, and Twitter and Facebook. It just blows my mind, and is a little daunting! I can do it, but I'm just so much slower, so it can make me feel like I'm behind. But when I’m actually coding, I'm fine. Megan, what’s your advice for other people who are considering a coding bootcamp? Megan: Having a few months of exposure to code, prior to starting We Can Code IT, was helpful. It didn’t give me any actual experience, but it introduced me to some of the basic syntax and logic I saw during the bootcamp – that was immensely helpful. Also, exposing yourself to code mentally prepares you, and shows you whether you like to code enough to commit to a coding bootcamp. It’s also important to be aware of how much time, effort, and energy a coding bootcamp is going to take, and being able to account for that time in your life. Diane: I knew it was called a coding bootcamp, and that we were going to be coding for three months, but I didn't expect as much emphasis on careers. After the first month, the career services started to get more intense, and that really is a huge commitment. It was pretty stressful, but learning new coding languages was fun. My advice is to know what you are getting into because you’re making a financial commitment, and sometimes putting aside your career for a short period of time. In general, would you recommend going through a bootcamp with a friend or a family member? Megan: You should know your own learning style. I was always a very independent learner, and I can't say that our dynamic shifted that much at coding bootcamp because we both pretty much worked on our own. There were only a few moments when one of us was particularly stuck on something and needed to bounce an idea off of each other. I would say we probably work together about as much as anybody else in the class did, even though we're living in the same house. But as long as you’re not inclined to rely on the other person really heavily, I think it’s a great idea. You have someone to carpool with and depend on. And you always have someone right there who can look at your code when you’re working on homework and need a second set of eyes. So little things like that are just really nice and super convenient. And it's also just fun to have a shared experience with my mom. Find out more and read We Can Code IT reviews on Course Report. Check out the We Can Code IT website.